Habit at KiHana Nursery Kihei, Maui, Hawaii (USA). February 15, 2011. Origin and Habitat: South and Eastern Cape Province of South Africa north to Natal eastwards to central KwaZulu-Natal; common in the Fish River valley in the Eastern Cape. Habitat and ecology: Crassula perforata is a scrambling succulent that grows through and over other bushes. Crassula anthurus E.Mey. ex Harv. Crassula perforata f. variegata hort. Description: The 'String of Buttons' or 'Necklace Vine' (Crassula perforata) is a small, "stacked" and compact scrambling succulent shrublet that stays relatively low and clumps readily. It is up to 45 cm tall or more, with secondary branches rising nearly vertically bearing subdistant or distant leaf pairs, that are congested at the leaf tips. It blooms with inconspicuous pale yellow flowers in spring. The leaf margins often have reddish tinges and is quite showy. This plant is called Necklace Vine because the leaves can be rotated around on the stem like beads on a string (this unfortunately to the detriment of the plant as this breaks the petiole, the leaf connection to the stem) or String of Buttons because the opposing pairs of lower cordate leaves appear threaded onto the stems and also Pagoda plant because of the regular arrangement of the leaves at the branch tip. Stem: Usually unbranchcd 10-60 cm long, wiry, slender, erect, subsimple, fleshy, later prostrate and woody. Leaves: In pairs, connato-perfoliate (fused) so that they appear to be like beads on a string, with the wiry stem pass through the leaf-pair. They are broadly ovate, patent or squarrose, keeled, scarcely uncial, with short-pointed tip, at right angles to the stem, 8 to 20 mm. long , 9 to 13 mm wide subdistant, cartilagineo-ciliate, glabrous more or less velvety. Gray-green and usually glaucous (covered with a light pruinose surface) with red or yellow cartilaginous margins, impunctate or with small whitish or pink dots on the margin. The fringe is generally conspicuous, but sometimes deficient or obsolete. These characters preserve moisture and protect from strong sunlight). Inflorescence: It produces an elongate cyme with numerous small creamy flowers in a 15-30 cm long, interrupted, contracted panicle (thyrsus), the branches corymbose, dense, with tooth-like bracts. Flowers: Very small, white sweet-scented. Calyx short, ovate-oblong, glabrous, keeled; petals connate at base, oblong, submucronulate up to 2.5 mm long; styles shortly subulate. Blooming season: In cultivation this species may flowers in every time of the year when conditions are appropriate, while in habitat they tend to be produced mainly during spring and summer (November to April). Similar species: Crassula perforata is similar to Crassula rupestris, with which it co-habits, but C. rupestris is quite distinct, having a rounded dense inflorescence with leaf-like bracts at the base, and it flowers at a different time, winter, whereas C. perforata flowers in spring or summer. Remarks: In country homes one will find flower pots with the long, hanging branches on shelves or between windows. In the past years these plants have been gaining in popularity and a large number of hybrid and cultivars has been grown. There is also a nice cultivar with yellow-cream variegation (see: Crassula perforata f. variegata) which fades as the older foliage matures. Crassula perforata Thunb. : has secondary branches rising nearly vertically. Leaves fused appearing to be like beads on a string. Cyme elongate 15-30 cm long. Distribution: Eastern Cape to KwaZulu-Natal. 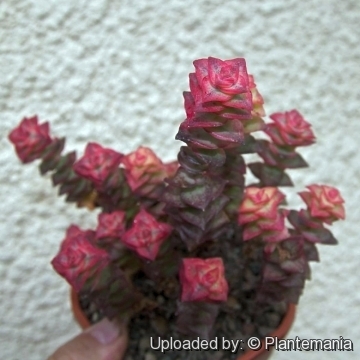 Crassula perfossa Lamarck: is difficult to tell apart from Crassula perforata, if not the same. Distribution: South Africa. 1) Forest & Kim Starr “Crassula perforata (String of buttons”. Plants of Hawaii. <http://www.starrenvironmental.com>. Web. 27 Sep. 2014. 8) Toelken, H.R. 1997. “A revision of the genus Crassula” in southern Africa. Annals of the Bolus Herbarium 8,1-595. 17) San Marcos Growers contributors “Crassula perforata - String of Buttons. San Marcos Growers <http://www.smgrowers.com>. Web. 27 Sep. 2014. 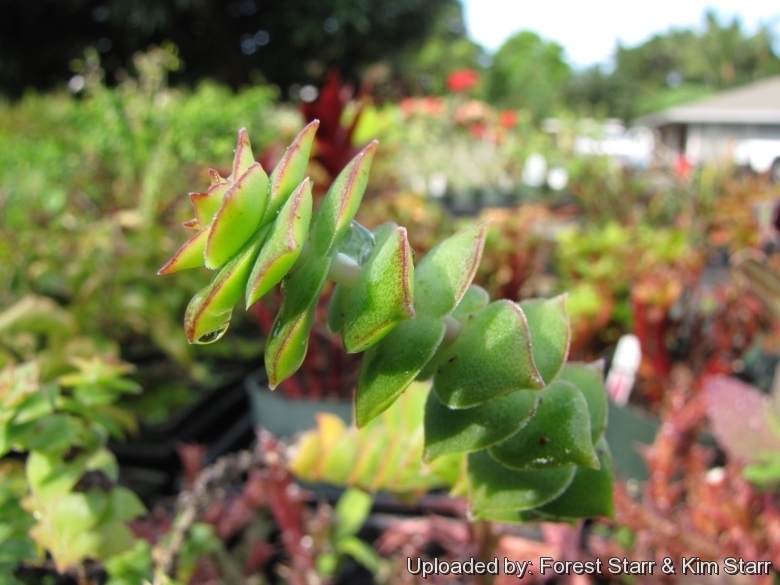 Cultivation and Propagation: Crassula perforata is a an easy to care popular succulent grown also as a suspended plant. It does well in light homes between the windows too. Plant in a well-drained soil in full sun to light shade - needs some protection from midday heat in hotlocales but the brighter light brings out the red tones and plants will flower more. Soil: They will require a free draining and rich compost. Waterings: They need adequate watering during the growing period and only light application of water in winter so that the leaves do not shrivel unduly. Fairly drought tolerant elsewhere. Exposure: Requires good light to keep the plants compact and encourage leaf colour and flowering. The pruinose stem coatings of the plants in our collection sometime is not so intense as those of the plants in their natural habitat but the difference in coating is thought due to the higher humidity and less intense sunlight of our climate. *Maintenance: After growing for some time the stems tend to become untidy and pendulous and should be cut very short or restarted from cuttings. Pests and diseases: Crassulas are sensitive to mealybugs. Propagation: It is propagated with ease from the short shoots which are potted into rich, porous soil where they quickly take root.